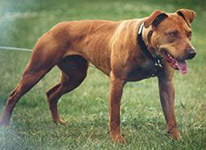 WHAT IS A "REAL" PIT BULL? Are they the same breed? 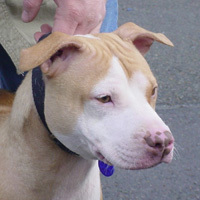 What is the difference between a "pure" pit bull, an American Staffordshire and a hybrid pit bull/Am Staff mix? Can you tell the difference by looking? Is there a difference in temperament? Is one "better" than another? CLICK HERE for more information on this. 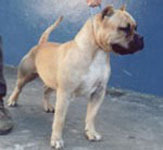 The dog at left is a hybrid. 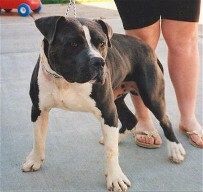 He was an American Staffordshire / pit bull mixbreed, registered as a pit bull with the UKC and ADBA. 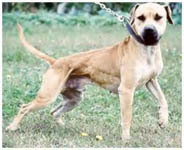 He had to be euthanized due to severe hip dysplasia. 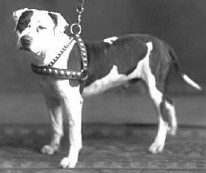 What does a "pure" pit bull look like?